From the smallest micro-merchant to larger retailers, the retail POS & payments package enables sales to be processed in store and on-the-go. Designed for use in retail outlets, this fully functional POS solution gives you the ability to process transactions, control inventory, take secure card payments and use powerful analytics to help grow your business. The brand new Star TSP143IIIU receipt printer. The Star TSP143IIIU connects directly via a charging cable to your iPad both charging the iPad and allowing you to continue to print receipts even if the internet is down. No bluetooth or ethernet connection required, no wires and no fuss! Star Micronics have introduced the TSP100IIIU USB Printer which is able to be connected directly to an iPad using the Apple Lightning Cable. This allows direct communication between the iPad and the printer while simultaneously charging. At the back of the printer there are three ports as shown below. Plug the lightning cable into the iPad and the USB end into the left port ( 1 above ). The next step is to configure the printer in AirPOS. Open the AirPOS application and tap on the settings cogwheel at the top of the screen. Select 'Peripherals' from the left margin. Press the 'Add Printer' button in your peripheral settings as shown below. In the next screen select 'Bluetooth'. You'll see the printer's name in a blue box in the refreshed screen. Tap on the name and press the 'Next' button. 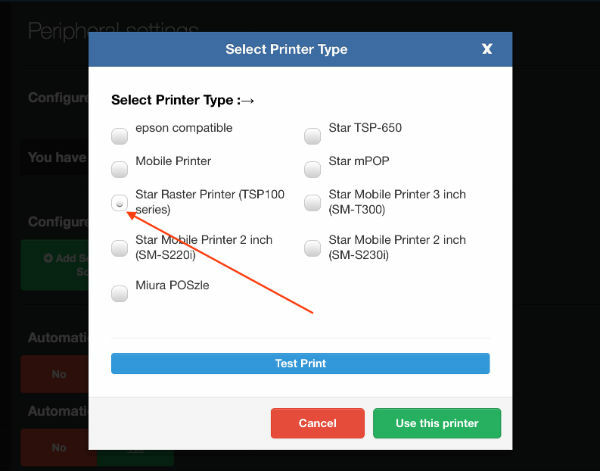 In the next screen select the printer type, which in this case is "Star Raster Printer (TSP100 series)" and press the green 'Use this printer' button to save your selections. 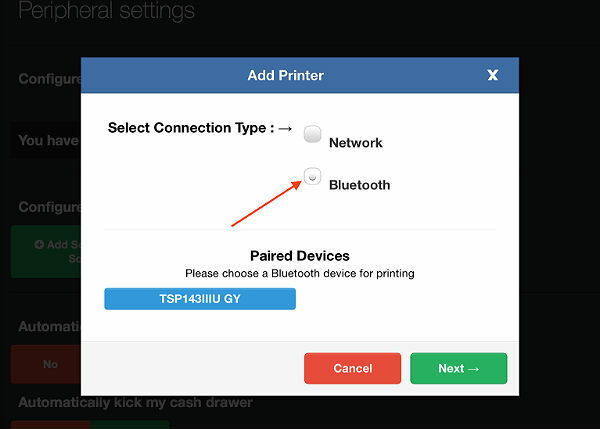 The Cash Drawer is kicked by an electrical impulse from the printer so the cash drawer connects into the printer at the port marked ‘DK’ via the RJ11 cable. The next step is to connect and setup the barcode scanner. The Socket Mobile Bluetooth Cordless Handheld Scanner (CHS) 7Ci is a durable, high-performance 1D laser barcode scanner certified by Apple for iOS devices. At present it is the only barcode scanner with Apple MFi certification. On the iPad you can set it up within the AirPOS POS application as follows. Press the settings button, the grey cog icon at the top right of the POS on your iPad then from the left panel click ‘Peripherals’ and you will see the following screen. If you press the ‘Setup Socket Mobile Scanner’ button a modal window will appear with instructions as seen here. You can scan these barcodes from the screen with this scanner. Now that your printer, Barcode Scanner and Cash Drawer are connected the next step is to setup your iZettle or PayPal here ‘Chip & PIN’ card reader if you have one. Click on the relevant link below. tablet enclosure for your iPad consists of two components, a 10" Universal tablet stand and a cash drawer enclosure (not included with this package) that the stand attaches to for security and ease of use. The cash drawer enclosure helps to protect your cash drawer as well as providing a secure base for the tablet stand, with a rotation feature allowing the tablet stand to move around as required on a solid base.